In September 2016, second and third-year students at University of Plymouth were set a unique challenge as part of a new partnership between the School of Art, Design and Architecture and The Dartington Hall Trust. They were asked to design an eco-pod which would become part of new camping facilities on the Dartington estate, a 1,200-acre country estate on the outskirts of Totnes in South Devon and an internationally renowned centre for progressive education, ecology, the arts and architecture. The only stipulations were that their design should embody the values and principles of the estate’s emerging vision and strategy; be an exemplar in sustainable construction and positively contribute to its surroundings. Eleven teams of students from the BA (Hons) Architecture and BA (Hons) Architecture Technology and the Environment courses took part in the competition, and one winning design was then developed by University of Plymouth academics and natural builder Duncan Passmore, with construction beginning on-site in October. 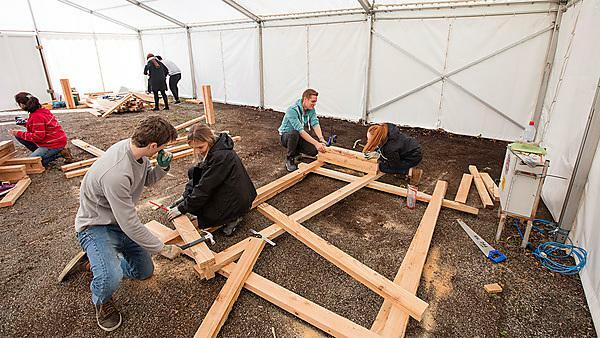 The 10-week build was led by professionals working with around 125 students from the University, providing many with their first taste of a full-scale construction project. The project is integrated into BA (Hons) Architecture coursework led by Lecturer in Architecture Andy Humphreys. The pod was constructed using local and sustainable materials including larch, Douglas fir and sheep’s wool, while craft tutors on the Trust’s wide-ranging craft education programme helped create a bespoke interior that will provide guests with a unique experience as part of the Trust’s new camping initiative. The design and consultation collaboration between the University of Plymouth and Dartington Hall Trust is part of a longer-term ambition to support students’ learning in sustainable education through direct experience of making. A striking new eco-pod designed by students from the University of Plymouth has been unveiled on the Dartington estate in South Devon. Here is an interview with Simon Bradbury, Lecturer in Architecture. Watch an interview with the architecture students talking about the process of the Tiny House project - from design to completion. The Dartington Hall Trust is currently going through a time of significant transformation. We are working towards a new long-term vision to be a pioneer of deep personal and societal change, inspired by our founders Dorothy and Leonard Elmhirst and their concept of a ‘many-sided’ life’.